My favorite part was his molars. Here is my dancing dino, a sort of t-rex with horns. That head kindof looks funny, like it's twisted backwards, but the initial impression is cute, so meh. Anyhoo, have a great Wednesday! Doodled birds. I think the ostrich turned out a bit wonky, as I didn't leave myself much room for the legs... I think my favorites are the quail and the egret. Doodled fish. I kept wanting to come back to doodling jellyfish and octopi, but thought those designs were getting a bit old. I chose to doodle some sea creatures with some bones this time. (I had salmon for dinner last night, so delicious fish was on the brain). More sea creatures. I don't think I'm quite *out* of the hangtag-making mode, so I think I'll make some doodled kitties next. Happy Tuesday morning to you. So here's what I ended up with for my husband's b-day card! I should have written, "I wuff you!!!" Haha, too cheesy. My husband loved the highfive loltink, BTW. Teeee hehhehehe! It's my husband's birthday today and I was taking pics of our dog, Tink, so I could draw/paint her for his birthday card. I couldn't resist making this loldog for him. Our dog is so cute and sweet. She's a yellow lab/sharpei/whippet(?) mix. I made this fun little interactive ATC yet again for the craftster ongoing ATC swap... I have such fun making these little things and then get so sad that I must mail them off forever!! While rock looks on with shock and horror. The pic is cut from an old children's encyclopedia. I remember a song in Spanish class baack in the day where the Spanish baby chicks say, "pio! pio!" whereas the American chicks say, "cheep! cheep!" I like 'pio' better, so I stamped that instead. With that, I'll tell you what my favorite books are, so you can try them if you want to: Harry Potter Series, Twilight Series, Watership Down, Jane Eyre, Xanth Series, etc. I'm not a big reader, so my tastes may be a little bland! Oh well, happy weekend. Tee hee, I love this little spider guy! Ok, now I'm going to go lounge and read some HP under the ceiling fan. Here's the back with those little wings! I've had a real head-achey last couple of days. I fell asleep on the couch the other night and when my husband got home from work he was helping me up to go to bed when I sat up... Unfortunately, my eyes were closed and I wasn't aware that his face was so close to mine, so as I sat up quickly, I crunched my nose on his forehead. It was agony. I'm pretty sure it's not broken, as it doesn't look it and didn't bleed, but it sure is tender and has been giving me headaches. Blargh. The bat's wings fold out to reveal a toothy up-side-down smile. Halloween is coming! Are you excited? explanation: I recently lost A LOT of hair for some unknown reason. It's all starting to grow back resulting in a very fuzzy hairline. Why am I posting this on my crafting blog? Because it's my blog and I shall do what I please. Ok, now this is really, really old. 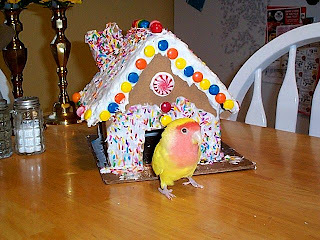 I made this gingerbread house in highschool, and just discovered the photos recently! Anyone who has a lovebird hen will be nodding their heads at the female lovebird's unstoppable cave-seeking behavior... This is Kitty, my long-time buddy. She is ALWAYS on the lookout for a new nesting cavity, so she had to check this one out.